Dog Training FAQs - Melanie Cerone, Ph.D.
On this page you will find answers to frequently asked questions and helpful information for local dog owners in the Newtown Square, Main Line, & suburban Philadelphia areas. What are your qualifications for dog training and behavior consulting? Dog training is an unregulated industry. There are no required minimum standards for education and experience in the dog training field, and anyone can call themselves a dog trainer. I felt an ethical responsibility to raise the bar and provide the high standard of care that dogs and their owners deserve. To that end, I have trained extensively and earned multiple certifications to ensure that I am providing the most current, evidence-based services to my clients. I am a licensed psychologist with 30+ years of experience in cognitive and behavioral treatments and applied behavior analysis. I am an honors graduate of Jean Donaldson’s world renowned Academy for Dog Trainers, where I earned my Certificate in Training and Counseling (CTC). I am a Certified Professional Dog Trainer – Knowledge Assessed (CPDT-KA), which is a national certification demonstrating that I have passed rigorous standards of science-based education in dog training. 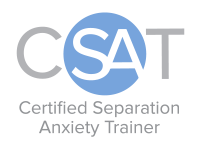 I studied with Malena DeMartini and graduated from her intensive training program to become a Certified Separation Anxiety Trainer (CSAT). I am a Pat Miller Certified Trainer (PMCT), and have attained a Certificate in Applied Animal Behavior (UW-AAB) from the University of Washington. As a Fear Free Certified Professional (FFCP), I am committed to preventing and alleviating fear, anxiety, and stress in dogs during veterinary visits. I am a highly trained professional who is committed to using training and behavior modification methods that are safe, humane, efficient, and effective. I will help you attain your training goals without the use of force, pain, or fear. I want to you to enjoy the peace of mind of knowing that you are working with a qualified specialist dedicated to connecting the dots between your training goals and training results. Click here to read more about Melanie Cerone and her dog training credentials. I offer a full range of in-home dog training and behavior modification services. All services start with a 90-minute initial in-home consultation. I will meet meet with you, your family, and your dog, listen to your concerns, assess the function of your dog’s behavior, and offer recommendations for training, management, and exercise/enrichment. From there, I offer two paths for training – a Coaching Path where you learn to train your dog through weekly in-home sessions with me and a Day Training Path where I train your dog for you three days per week and then transfer the new behaviors to you at the end of the week. Day training is a nice option for busy clients with full plates because I’ll do the heavy lifting and then transfer your dog’s newly learned skills to you. I have a particular passion for working with fear and reactivity and aggression towards humans, including food aggression, aggression during body handling, and aggression towards strangers. Additionally, I have the specialized training and experience needed to help dogs overcome separation anxiety, a heartbreaking and debilitating disorder. My dog is aggressive on leash. Help! I love helping people understand the function of their dogs’ leash reactivity, as well as helping dogs feel more comfortable when they encounter other dogs. Frequently, dogs use their aggressive displays – barking, growling, snarling, lunging – to create distance between themselves and the other dog because they are afraid. My goals are to help your dog feel good about seeing other dogs while on leash and to teach her an alternative behavior to barking, growling, snarling, and lunging in the presence of other dogs. My dog is not comfortable walking in crowded locations. Are there any parks or trails in Newtown Square or Delaware County that you can recommend? We are fortunate to have several lovely dog walking areas in our local community! The Okehocking Preserve in Willistown Township offers about seven miles of mown and natural surface trails. Additionally, there is a leash-free field located near the Delchester Road entrance to the park where dogs may enjoy off-leash frolicking their friends. Ridley Creek State Park in Edgmont, Middletown, and Upper Providence Townships offers 12 miles of hiking on four main trails through rolling woodlands, including one of the longest creekside walks in Delaware County. Rose Tree Park in Media offers rolling meadows, woodlands, and trails where you may walk your dogs. Please abide by the leash laws when walking your dog in any of these parks to ensure that everyone enjoys a safe and positive experience! My dog HATES going to the vet. Is there any way you can help with this? Absolutely! Dogs need veterinary care their whole lives, and many dogs have issues with fear and aggression during veterinary visits. As a Fear Free Certified Professional armed with specific training plans from The Academy for Dog Trainers’ Husbandry Project, I’m uniquely qualified to help dogs who have had traumatic experiences at the vet’s become happy, cooperative participants in their own veterinary care. Will you travel to my home to train my dog? Yes! I offer in-home consultation, training, and behavior modification services. It is also quite common to take training sessions on the road for socialization, to practice at the vet’s, or to work on leash skills in the community. I have a newly adopted dog and I’d really love to get him off on the right paw. What services would be best for this? I recommend starting with an in-home consultation. At this consult, I’ll meet your dog, take a history, and listen to your concerns about your new dog. Then we’ll discuss your expectations, needs, and training goals. We’ll prioritize the behaviors you’d like to address – from basic manners to issues related to fear and aggression that may require more intensive intervention. We’ll work together to set specific goals and carve a personalized path to reaching them. Do you offer services in Chester County? Ardmore, Berwyn, Bryn Mawr, Exton, Chadds Ford, Devon, Garnet Valley, Glen Mills, Haverford, Kennett Square, King of Prussia, Malvern, Media, Newtown Square, Paoli, Phoenixville, Radnor, Rosemont, St. David’s, Strafford, Unionville, Villanova, Wallingford, Wayne, and West Chester.